Something I came across recently and thought was really neat is an app called CodeSwarm. 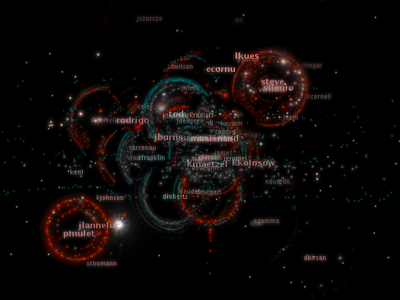 In a nutshell, it shows the history of commits in a software project, day by day and as cool organic images. This is a snapshot in time of the Eclipse project. Enter the repository URL, a few seconds later it’s done and playing onscreen. You can also get it to dump out images and then assemble them into a video with a soothing backing track like many others have done.